Apparel manufacturing plays a vital role in the development of countries economy, because of exporting garments to other countries and the constant growth of foreign exchange is increased. Even now-a-days Domestic Readymade industries are also is increased rapidly. So, the Apparel Engineers Duties and Responsibilities are most important in the Domestic/Export Apparel Manufacturing Industries. As for as the Apparel Engineer concerns having eight areas of responsibility that need to be well organized given under headings. Training-How to train the new employees and sewing operators. Operator output-maintains high output and also the improving the abilities of those with low output. Waste control-in materials, supplies and machinery. Standard conditions-in the workplace, in sewing method, in the machines. 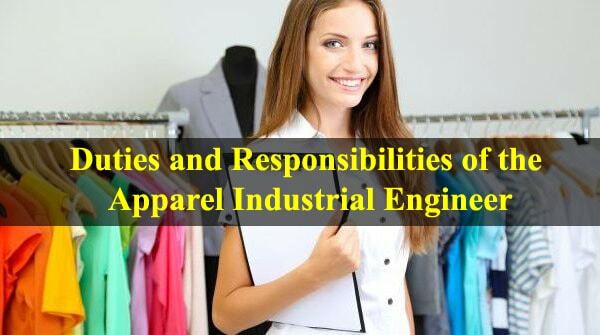 APPAREL Industrial Engineers are also be showing their skill and attitude towards as an ’Executive as a Leader ‘to maintain the following three areas to be focused mentioned here under. Working together with the co-employees towards the ‘Team Spirit’. Due to increase the higher productivity, he has to take the following tasks to be achieved properly. Sewing operators transfers between the operations. Rights to reject the defective product. Rights to take Disciplinary actions against the employees/operators. To execute his duties and responsibilities in such a good manner, every industrial engineer must have the primary and secondary obligations. Control quality and free from defects. Develop the employees and sewing machine operators. Material utilization in an economical approach. Follow up on low output employees. Maintain discipline inside the Apparel factory. Handle parts that required reprocessing. Encourage them to start work early. Make adjustments to balance the line as per absence. Attend the production meeting and discuss yesterday’s result and today’s targets and plans. Plan to increase the employees’ efficiency. Plan to improve the outgoing quality. Plan to prepare for routine problems or problems that might arise. Measure the target vs. actual output in every hour. Check inline and end line quality reports. Discuss with quality inspectors perform quality drill. Work with the low output operators. Check the proper method and to be implemented. Motivate and empower all the operators. Follow up on newly joined operators in training. Follow up the operator in re-training. Identify the bottle neck operations and balance accordingly. Provide immediate and continuous follow up to repairs. Authorize any off-stand and ‘clock out’. And at the end of the each and working must make sure the operators have turned off their machines, cleaned their work area,kept a piece of fabric under the pressure foot, and covered their machine. Check and authorize the production worksheet. Review the hourly production report and WIP-report. Analyze the next day’s needs and take notes for implementation. Calculate the next day’s initial inventory according to production information. Review the capacity studies of low output operators. Plan operator cross training to solve balancing problems, and as and when required he has to resolve any operator efficiency problems. Follow up and motivate new employees, work out quality problems with operators; review the proper method with them when necessary. Industrial Engineers role is very important in the Apparel Manufacturing sector for the betterment of achieving productivity, quality consciousness on the product output, employees, operators to be trained well to achieve targeted efficiency and growth of the industry at most satisfied level. Apparel Manufacturing Analysis, Sewn product Analysis-GLOCK.R.E .and KUNZ, G.I. Industrial Engineering and Management-Mr O.P.KHANNA. Industrial Engineering in Apparel Production-Mr .V. RAMESH BABU.